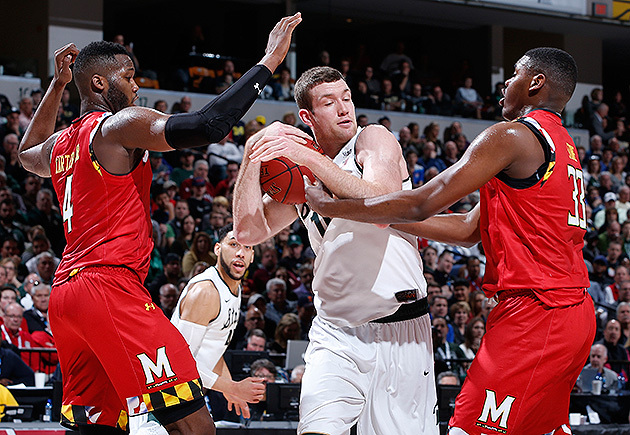 Maryland’s defensive effort against Michigan State on Saturday showed the Terrapins will be dangerous in the NCAA tournament if they defend to their potential. INDIANAPOLIS — No one had to wait long Saturday to discover what Maryland would do when Michigan State smacked it in the mouth. That occurred on the very first sequence of their Big Ten tournament semifinal, in very literal fashion: Jake Layman backed into the post, dipped his left shoulder, charged into the lane and scored off the glass while he got whacked across his face. As the Maryland senior jogged down the floor, he worked his tongue around the affected area, a sore and bloody sector of his gums. And then this one thing led to another. On the very next Terrapins offensive possession, Layman tangled with Michigan State’s Eron Harris and neither player peacefully dispersed. Harris threw off Layman’s arm. Officials stormed in and assessed a double technical foul instantly. Then the rest of the players on the floor convened for additional commentary. Most notably, Spartans’ star Denzel Valentine approached Layman and, judging by the reaction, made some points that the Terrapins forward strenuously disagreed with. “I’m ready to play!” Layman barked over and over at Valentine, which at the time sounded less like a statement than a threat. But that’s the question, isn’t it? How ready the Terrapins are to play a granular, tough-minded brand of basketball, now that a 64–61 loss to the Spartans at Bankers Life Fieldhouse turns their attention to the NCAA tournament? Because while the result created a locker room full of regret sagging expressions, there was nevertheless something auspicious about it. Maryland can be a Final Four team if it defends the way it did against the team that came into Saturday with the most efficient offense in the country, especially in a second half when it looked perfectly comfortable in a half-court rock fight and nearly won it. That theory may not have established permanent residence at the front of the Terrapins’ minds before this week. They entered Saturday as the 40th most efficient defense in the country, per kenpom.com. While only one national champion has finished outside the top 30 in defensive efficiency since 2001— Connecticut in 2014—it’s worth noting that the capacity to play top 30-caliber defense is perhaps more critical. Duke started last year’s NCAA tournament ranked 57th in that area, in fact, but it finished the season 12th and showered with confetti just down the street at Lucas Oil Stadium. Based on the admittedly small sample of Friday and Saturday, Maryland has the capacity to asphyxiate as needed, or at least as it much as it cares to. It allowed Nebraska, no one’s idea of offensive clinicians, to post 86 points in a Friday quarterfinal win. And then the very next afternoon, the Terrapins held Michigan State to .767 points per possession in the second half and created nine turnovers while limiting the Spartans to 28.6% shooting. A team not exactly known for rebounding prowess only lost that battle 38–31 and actually outperformed Michigan State on second-chance points (12 to 7). Maryland hounded Valentine, a national player of the year favorite, into a 4 of 12 night overall and it smothered Bryn Forbes off every screen, leaving Michigan State’s sharpshooting second-leading scorer virtually no space to get anything remotely close to a clean look. Early on, Forbes turned down a corner three-pointer and Spartans coach Tom Izzo blasted him for his reticence; still, there was a Maryland defender bearing down on Forbes shortly after the catch, and some discretion seemed justifiable. Replicate all that, and the Terrapins can cut a swath through the field of 68. But it is easier said than done, because Maryland hasn’t done it regularly. • Bracket Watch: Who’s in and out? Which teams get No. 1 seeds? To draw that out, Turgeon conducted a refresher course leading into the Big Ten tournament. And even as the effort slouched against Nebraska, at least the Terrapins were upset about it. “With how bad we were [Friday] we needed to come out a lot better, and we did,” Layman said. That’s progress of a kind, and that resolve helped them redeem themselves a bit on Saturday. The offense, moving forward, shouldn’t be a worry. Yes, every trip was a taffy pull on Saturday, with the Terrapins shooting 33% and receiving no reliable shot-making from Trimble (2 of 15), Layman (2 of 8) or guard Rasheed Sulaimon (3 of 10). After the Terrapins took a lead with 6:55 remaining, they didn’t score for the next five-plus minutes. Given a lane to drive to a go-ahead and possibly game-winning bucket in the waning seconds, Trimble’s shot at the rim didn’t come close to falling. He, too, had bled on this afternoon, when his face got in the way of a Valentine pass; at the end he just laid on the floor with his balled fists over his eyes, exasperated by still another miss. Of course Maryland won’t sniff the Final Four with offense like that. But the offense shouldn’t be the worry. “That team, as I said early this week to my guess, is still the most talented team [in the Big Ten] with the most NBA players,” Izzo said after the game. That talent will produce buckets. The Terrapins must retain the corresponding dedication to defend if they want to be a threat into the second weekend of the NCAA tournament and beyond. They’ll have to remember how they almost beat one of the best teams in the country: They didn’t do a ton right on one end, and they did almost everything right on the other. On Saturday, the Terrapins seemed ready to do just that. How long that feeling lasts will determine how long they last, period, starting next weekend.